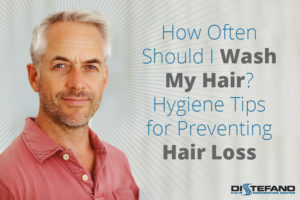 According to statistics from the American Hair Loss Association, nearly two-thirds of all men will experience some noticeable hair loss by the time they reach the age of 35. Baldness or thinning hair is primarily caused by genetics, but hygiene can also play a role in hair loss. While specially-formulated hair care products can provide hair with much of what it needs to be healthy, the frequency and timing of hair washing should be taken into account. Hair follicles contain oil-producing glands known as sebaceous glands. These glands produce sebum, a natural substance that is healthy for hair roots in certain amounts. At times in a person’s life, however, sebum production goes into overdrive. The build-up of sebum can cause the follicle to clog, restricting hair growth. While this is most commonly a problem for those undergoing puberty or pregnancy, it can also apply to men undergoing testosterone treatment for medical reasons. Regular washing with shampoo can help remove these oils and maintain a healthy amount of sebum on the scalp. More commonly, the mistake people make in their hair-care routine is over-washing. The immediate effect of washing the hair too much is that weak or dead hairs fall out. In the long-term, too much washing with shampoo and conditioner can make the hair dry, brittle, and more likely to break off or fall out. This is due to the sulfates and other chemicals found in most shampoos. So, How Often Should I Wash My Hair? Each person is different—there is no magic answer. Those who are producing more sebum should consider washing more often. It may be surprising, but in general, try to shoot for washing with shampoo no more than three to four times a week. This doesn’t mean the hair can’t get wet, though. Continue to massage and exfoliate the scalp during showers to remove excess dead skin and dirt. Even people who follow the strictest of hygiene regimens are not immune to the effects of time and genetics. Thankfully, those who suffer from hair loss now have more options than ever before. Modern medicine has developed a number of safe and effective hair loss restoration techniques that can restore a person’s hair and confidence. DiStefano Hair Restoration Center is at the forefront of applying these techniques and helping patients look and feel their best. With convenient locations across New England and highly-experienced doctors, DiStefano Hair Restoration Center is your best choice for reducing the effects of hair loss. Contact us today to learn more.